The African Spoonbill is a wading bird found in many parts of Africa. This particular bird, though, I found at the Honolulu Zoo. I was impressed by its stately bearing. The bird and its reflection in the golden pool make a peaceful composition. Almost makes me want to meditate! African Spoonbills nest in colonies in trees near water. Their long legs are perfect for wading in varying depths of shallow water to find food. With their spoon-like bill which they swing back and forth across the surface of the water, they scoop up small fish, crustaceans and other aquatic life including insects. When they fly, they keep their long necks outstretched. 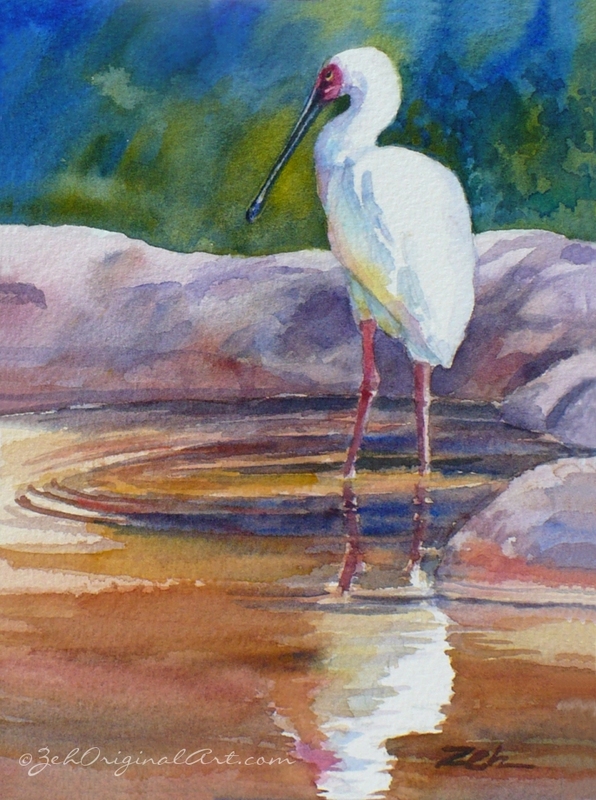 You can currently find the original painting of African Spoonbill for sale in my Etsy shop, Zehland.Etsy.com.